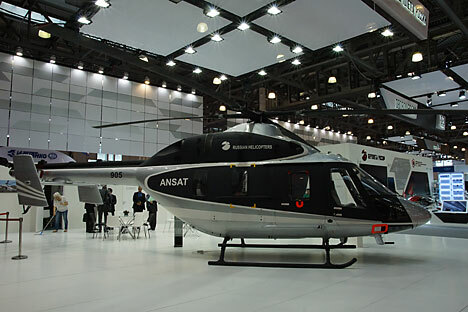 The Russian Helicopters Corporation (a subsidiary of Rostec) will exhibit several of its latest light and medium multirole commercial helicopters at the 8th international air show in the Iranian city of Kish on Nov. 16-19, according to the corporation’s press office. The visitors will see models of the Mil Mi-172A2 (NATO reporting name: Hip), Ansat and Kamov Ka-226T (Hoodlum) helicopters in the passenger variant. The commercial multipurpose machines are on display to promote demand for the company’s aircraft on the regional market. "Russian-built helicopters have proven to be indispensable on a wide range of missions owing to their reliability on hot-and-high operations and ability to land in unprepared landing zones [LZ]. I hope that Iran, an operator of Russian-made helicopters, will expand its helicopter fleet and ramp up the acquisition," says Russian Helicopters Deputy Director General for Business Development Alexander Shcherbinin. Airshow China 2016: What did – or didn’t – Russia manage to sell? The Ansat is a light multirole twin with a seating capacity of 7-9 passengers. Its export has started in late 2016. The Mi-171A2 embodies the latest aircraft technologies and meets key flight safety and environmental friendliness standards. Its up-to-date avionics suite allows round-the-clock operations in any weather and flying over the sea surface as well. The Ka-226T is a light coaxial-rotor machine ideal for use in the Middle East. It can operate in hot climes characterized by frequent sandstorms and gusts of wind. The helicopter is designed for flying in densely built-up urban terrain as well. It offers such advantages as the ability to land in small LZs, high maneuverability and a high rate of climb. At the Iranian air show, Russian Helicopters also will introduce operators and potential customers to the machines’ aftersales support system, using which it maintains the helicopters throughout their service life. The airframer’s staff will talk with their counterparts in Iran’s Panha Company, Red Crescent Society, Emergencies Ministry, Public Health Ministry and a number of Iranian carriers.